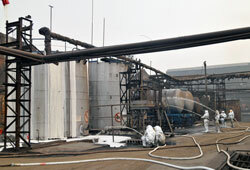 Plant & Refinery Accidents - The Gerardo Cantu Law Firm, P.C. If you or a family member has been involved in an industrial plant or refinery accident, you have the right to seek compensation for lost wages, pain and suffering, the cost of medical care and more. You can turn to the attorneys at our law firm to help you seek the compensation you need. With more than 12 years of experience on my side, you can be confident that we are not afraid to take action to get results for you. You pay nothing unless we win your case. At the personal injury law firm of The Gerardo Cantu Law Firm, P.C. in Houston, Texas, we handle all refinery and plant accident cases on a contingency basis. When our lawyer investigates refinery and plant accidents that involve workplace injury or death, we frequently discover that safety violations have taken place. Our team is familiar with OSHA regulations, so we know how to spot safety violations. However, we also know that safety violations may go deeper. Often, we find that an accident is the result of a company violating the safety policies they have established for themselves. All of the information we uncover during the investigation will be used to build a case that is designed to do one thing: help you get the compensation you need. We can handle cases that involve defective equipment used in the workplace, plant explosions or the negligence of coworkers. While many of these cases involve workers’ compensation insurance coverage, others require taking action against parties other than the employer. We may need to take action against a contractor or the company that manufactured a defective piece of equipment. We will take action against whoever was responsible. Contact us for a free consultation: Call or send an e-mail. Get in touch with us today to discuss your plant or refinery accident with an experienced attorney.